Use the Edit Game screen to add games or edit games. Notes on some of the fields and actions are listed below, and annotated on the screenshot that follows. The Game Data metabox contains the basic schedule information for a game. It is basically the data that can be entered in bulk on the Add Games screen. Game League & Season. These fields are important. If they aren’t correct, the displays on the front end will not be correct. Non-league Game. Check this box to indicate a non-league game. Changing this checkbox will change the drop-down menus for the Home and Visiting teams, which may change previous selections. Home & Visiting Teams. Select the Home and Visiting (away) teams from the drop-down menus. Game Date. Select the game date from the drop-down. It can be entered as text in the format: YYYY-MM-DD. Game Location. The Game Location will default to the Home Team’s venue. 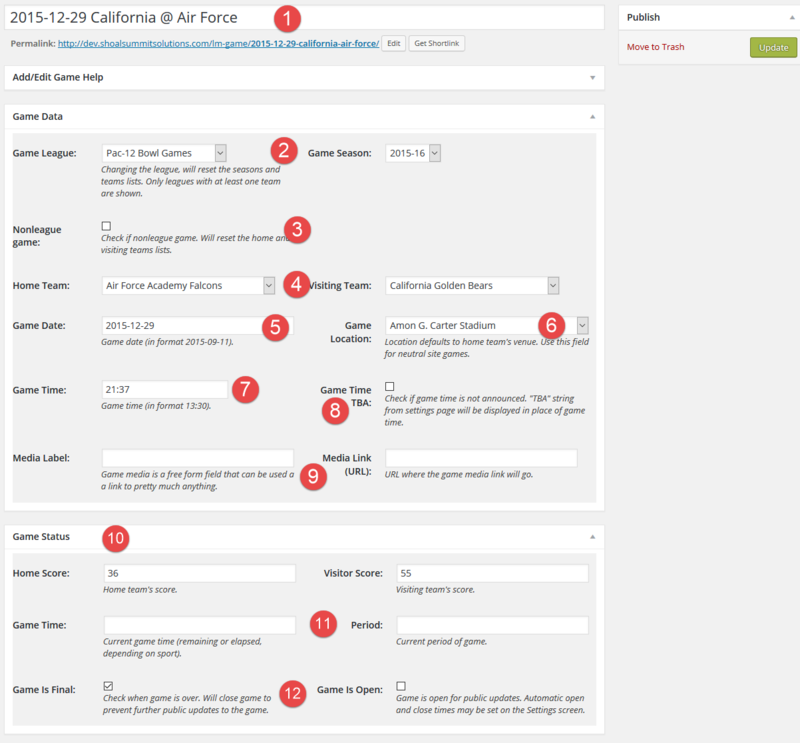 Use this drop-down for neutral site games, or if a home venue has not been entered for a team. Game Time. Enter the game start time from the drop-down. It can be entered as text in 24 hour format: HH:MM. Note that this field is irrelevant if the Game Time TBA checkbox is checked. Game Time TBA. Check the box if the game time is “To Be Announced”. The abbreviation (TBA, T.B.D., etc) may be set in the Settings screen’s Schedules Tab. Media Label & Link. Use these fields to specify a label that will appear in the “Media” column of schedule tables, and the URL to which that label will be linked. The Game Status metabox contains the current (on-going) or final status of a game. It is basically the data that can be entered in bulk on the Update Games screen. Home & Visiting Scores. Enter the Home and Visiting Team scores. Time Remaining & Current Period. Select time remaining in the game, and the current period. Enter the current game time and period. Note that “Time Remaining” may be the time remaining or the time expired, depending on the sport. Game Is Final. It is important to mark each game as final so that the shortcodes can display the appropriate status on the front end. If a game is marked final, the game time remaining and the period are irrelevant. (There is no need to enter 0:00 as the time and 4 as the period.) The Is Open checkbox will be used in a future release for live scoring.